Grosset & Dunlap, 9780448480879, 128pp. When ten-year-old Tiger Brooks and his family move into a new home, he sees some strange things at the house next door—like a talking pig in a top hat! When he and his neighbor, Luna Lopez, investigate, they discover a reclusive old woman and her magical golden frame, through which they can enter the world's greatest paintings. 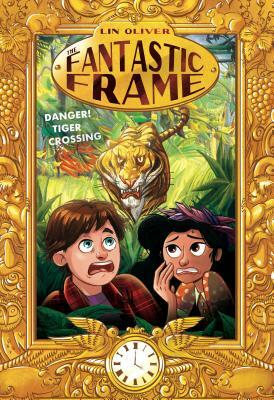 In this book, Tiger and Luna get pulled into the painting Surprised! or Tiger in a Tropical Storm by Henri Rousseau. But they must escape the jungle adventure before time runs out, otherwise they'll be trapped in the painting forever!